・　Japanese prosecutors will likely decide again not to indict three former Tokyo Electric Power Co executives over their handling of the 2011 Fukushima nuclear disaster, according to local media, but a rarely used citizen's panel could still force an indictment. They have been conducting a Josef Goebels propaganda war, saying there's a safe dose when there has never been any valid evidence for a safe dose of radiation. ・　North Korea dispatched covert commando teams to the United States in the 1990s to attack nuclear power plants and major cities in a conflict, according to a declassified Defense Intelligence Agency report. 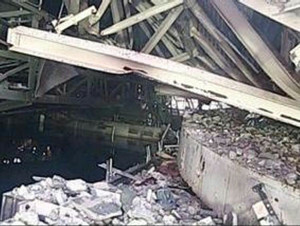 ・　Wednesday’s leak occurred on the same day a team of experts from South Korea spent three hours at the plant, looking into the safety of Japanese fishery products. 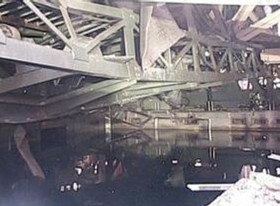 The group was informed of measures to keep the nuclear crisis under control, but apparently were not made aware of the leak, the Times reported. The team inquired about the types of radioactive materials in the water and the results of radiation checks on local seawater, according to Japan's Fisheries Agency. In September last year, South Korea banned imports of fishery products from Fukushima and seven other areas due to recurring water leaks at the Fukushima plant. ・　Many of the vehicles used at the plant don’t have license plates. They are so contaminated that they can never leave. ・　（開始４０秒～） If a second accident happens, it will be a catastrophe. Most areas of Japan will become unliveable. Restart of the reactors is unthinkable. 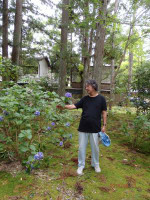 ・　In fact, many Japanese appeared to decide not to vote at all. Just some 52 percent of eligible Japanese cast votes on Sunday, the lowest turnout in postwar Japanese history. 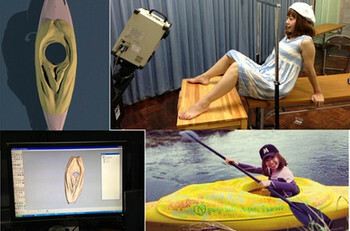 ・　Medical countermeasures included the use of stable iodine for thyroid blocking8. Potassium iodide tablets were prescribed to workers from 13 March 2011 onwards in accordance with previously defined criteria, and subject to them being interviewed by a physician regarding iodine hypersensitivity and any pre-existing thyroid condition . Approximately 17,500 potassium iodide tablets (50 mg) were distributed to about 2,000workers involved in the emergency response, including TEPCO workers, contractors’ workers, fire-fighters, policemen and Self-Defense Force personnel. ・　To destroy a people, obliterate their understanding of history. Either Japanese media executives haven't read "1984," or they've failed to get George Orwell's point. ・　Although the surrounding woods are as green and the ocean as blue as ever, an invisible blanket of death covers everything. You can’t feel it, you can’t smell it but it is there and will be for decades, perhaps longer. ・　The specter of cancer haunts you constantly. What does the future hold for you? Leukemia? Thyroid cancer? A deformed baby? ・　…… there had been an accident at one of the country’s nuclear power plants, briefly setting off fears of a Chernobyl-like catastrophe. 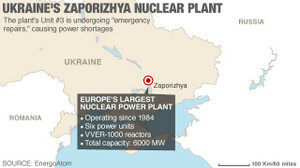 ・　Zaporizhya is Europe's largest nuclear power plant, according to EnergoAtom. It has been operating since 1984, with the third unit brought online in 1986. It has six power units altogether, with a total capacity of 6,000 megawatts.